A member of the organisation in Dublin, Ursula Ní Shionnain, was detained on Tuesday in what appeared to be a carefully planned Garda operation in county Offaly, and charged with arms offences. A further move to arrest party chairman Brian Leeson bore the hallmarks of a ‘black ops’ campaign against the entire organisation. Éirígí General Secretary Breandán Mac Cionnaith said Mr Leeson’s arrest and 72-hour detention was a “cynical exercise” designed to foster “black propaganda and misinformation” within sections of the media. “Brian’s release, without charge, confirms our view that his arrest had a clear political motivation,” he said. He linked the events to the left-wing party’s growing political support and its recent decision to contest local elections in the 26 Counties. Mr Leeson had played a central role in organising opposition to the austerity policies being implemented by the Fine Gael/Labour coalition in Leinster House, he said. “We are of the view that this arrest and the accompanying coverage by some media outlets is designed to undermine opposition to this forthcoming budget and to attack our party. “We also believe that it is more than just mere coincidence that Brian’s arrest came just over a week after the party voted at our annual Ard Fheis to contest local government elections in the 26 Counties. He also said the party would not take steps to distance itself from Ms Ní Shionnain. Media depictions of Irish republicans have become more heavily propagandised in recent weeks, particularly in the tabloid newspapers. A commemorative event in Dublin for prominent local republican and anti-drugs campaigner Alan Ryan, murdered by drug dealers in September, was described as a “terrorist party” in one newspaper. A separate incident in Newry has reinforced a belief that Éirígí, in particular, is facing an increased policy of suppression. An early morning raid and arrest on the Newry home of prominent éirígí activist Stephen Murney took place on the eve of Leeson’s arrest. It had demonstrated yet again the political nature of policing in the North, said éirígí spokesperson John McCusker. “Stephen is well-known as an éirígí party member in the Newry area who is very active within his local community. For the past couple of years, the PSNI have conducted a lengthy and intense campaign of harassment against him. “Independent human rights organisations are currently investigating this campaign of harassment against Stephen and other people in the Newry area. Indeed, they have documented evidence detailing this open political victimisation. It has included constant stop and search procedures, harassment, assaults, house searches and threats from the PSNI officers – all carried out under the guise of so-called ‘anti-terror’ legislation. The PSNI seized items from Mr Murney’s home which included éirígí party literature and personal items belonging to him and other members of his family. He was then arrested and taken to Antrim Holding Centre. McCusker added, “Many of Stephen’s neighbours gathered beside his home this morning in a show of solidarity and to demonstrate their abhorrence of the PSNI’s actions. I would commend those people for showing such communal solidarity with Stephen and his family. “Serious questions must be asked about the overt and aggressive political policing which is becoming a daily occurrence,” he concluded. 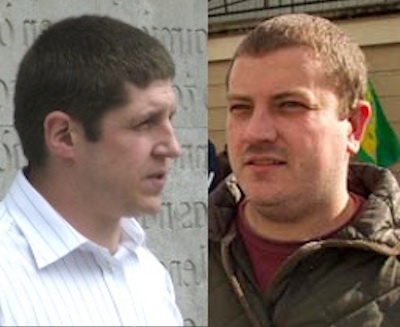 The Republican Network for Unity said the arrests were an example of “joined up political policing” between the Gardai and the PSNI which had been carried out to demonise Éirígí and its political work.